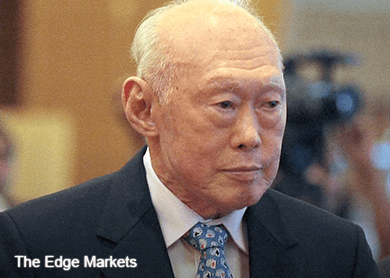 SINGAPORE (Feb 26): Lee Kuan Yew, Singapore’s first elected prime minister, remains in intensive care at the Singapore General Hospital. Lee, 91, was hospitalized on Feb. 5 to treat severe pneumonia, the government said on Feb. 21. He is sedated and on mechanical ventilation, according to a statement Thursday from the Prime Minister’s Office. “His doctors have restarted him on antibiotics and are continuing to monitor him closely,” the office said. Lee, the Cambridge University-trained lawyer who led the nation from 1959 to 1990, crafted a legacy of encouraging foreign investment, averting corruption and emphasizing discipline, efficiency and interracial harmony. His elder son, Lee Hsien Loong, has been prime minister since 2004. The current premier had surgery on Feb. 16 to treat prostate cancer. He returned home two days later and is expected to recover fully, the government said.